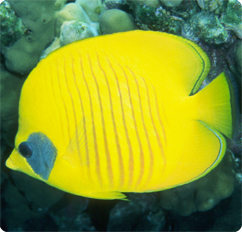 This butterflyfish is from the Red Sea and gets very large. They do better in pairs and groups, and do very well in the home aquarium. They will eat all kinds of food and will also go after corals, so you can’t place them in a reef tank, but they will do well in FO or FOWLR tanks. Butterflyfish do need space and peaceful tank mates, so they should be kept in large tanks. This butterfly comes down with red spot disease so you need to be careful before you purchase one.